A long-exposure Hubble Space Telescope image shows a majestic face-on spiral galaxy located deep within the Coma Cluster of galaxies, which lies 320 million light-years away in the northern constellation Coma Berenices. The galaxy, known as NGC 4911, contains rich lanes of dust and gas near its center. A majesticspiral galaxy swirling with dark tendrils of gas stands out in a new photo ofone of the most densely packed regions of the universe. The outerspiral arms are visible as a smoky white glow amidst a background packed withother galaxies. Almost 1,000galaxies reside in the ComaCluster, making it one of the densest collections of galaxies in the universe.Collisions among these galaxy systems continue in the present epoch to churnstar formation at vigorous rates and alter one another's shapes. 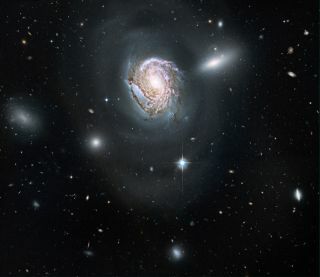 In thisimage, the gravitational influence of nearby galaxy, called NGC 4911A, in theupper right is exerting a tug on the galaxy's arms, loosening material thatwill eventually be dispersed through the Coma Cluster's center to fuel further starsand clusters between existing galaxies. The ComaCluster is 320 million light-years away in the constellation Coma Berenices. The imagewas formed from a considerably long 28 hours of exposure time, the SpaceScience Telescope Institute said in a statement. It combined observations fromthe 2006, 2007, and 2009 Wide Field Planetary Camera 2 and Advanced Camera forSurveys.